Not that you all probably care about my super fascinating, exciting (note the sarcasm) life, but I figured I would share some pictures that describe me pretty perfectly right now. I very rarely paint my nails, just because it gets chipped in 3 seconds, but if I did, this is the color they would constantly be. If anyone can tell me where to find these shoes, I will be forever in debt to you. I may even buy you a pair in thanks. Doing yoga. Lots and lots of yoga. Except I don’t look like that. I look more like an awkward cat. Eating as many veggie bowls from Chipotle as humanly possible. Watching this video. Oh my goodness gracious. Get ready to pee your pants. 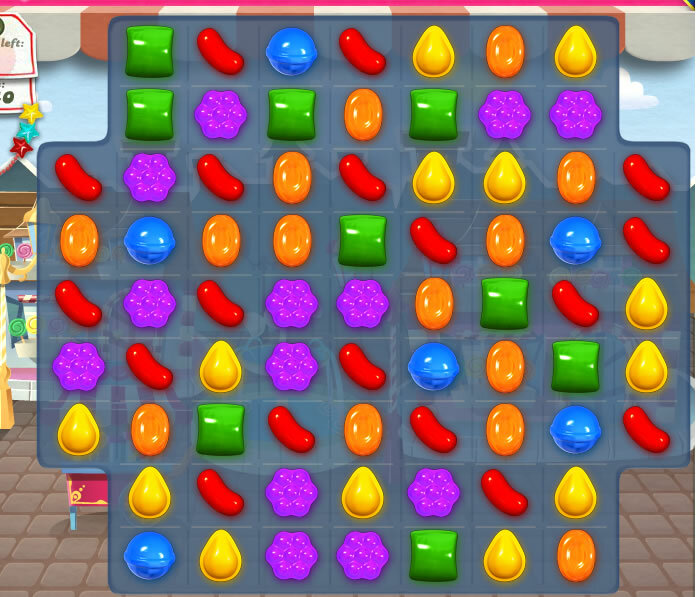 Playing Candy Crush. WHY DID NOBODY WARN ME NOT TO GET THIS?! Re-living this moment over and over. Today my mom told me I need to differentiate the fine line between persistence and annoyance. From here on out, I am vowing to be the most persistent person ever that wants to get a job with Ellen, and if I’m being annoying please come over and slap me. Would re-enacting that video from above be awesome or creepy? Awesome I hope, since now that the idea has popped in my head it’s all I basically want to do with my life. Wearing the coolest shirt in the whole freaking world that my awesome friend Tara made for me. She has one, too. They say “I want to work for Ellen.” YES YES YES. Hanging out with my girls and getting really excited when they will wear matching outfits. I wish it was acceptable to match my friends. That would be cool. Eating delicious food. This is muesli from Costco (the holy land in my opinion) with banana. Uh, yum. I basically want to live in California because they have delicious, healthy food like this everyone. And wine. They have great wine. Chilling with my sassy cat who gets really pissed when I stop petting her. Watching a lot of Ellen and wondering where I can get that wine purse. Finding this awesome frog outside and getting more excited than the kids. Rocking my Ellen sunglasses and being really awkward taking pictures on the way to work with my giant forehead. Loving this picture and this day! Sorry my posts have been a little random and all over the place lately. I have been super busy this week, but all that will slow down because I have 2 weeks off nannying now! Still working at the gym, but I get a little vacation up north which is very exciting. See ya’ll tomorrow! You guys. Please don’t judge me. I wanted to show you my room and didn’t realize what an awkward person I was until now. Enjoy this mess. My morning workout was intense and awesome. Since I train clients all day long and make up individual plans for them, when it comes time for my own workout all I want is for someone else to tell me exactly what to do! My breakfast was also quite delicious. I had a light n’ fit vanilla yogurt with a small banana, strawberries, blueberries, and roasted flaxseed from TJ’s. Doesn’t that look all patriotic and stuff? I also enjoyed some hazelnut coffee from my sampler pack from my new Keurig! Isn’t my mug adorable?! I got it at a craft show like, 4 years ago and it’s still goin’ strong. I hope I never need to get a new one! Some people say that it’s okay to have, eat, or do whatever you gave up for Lent on Sundays. Thoughts on this topic?? I was pleasantly surprised yesterday morning to wake up and to be able to actually breathe! I was feeling ridiculously sick on Friday (flu-like) and still wasn’t 100% yesterday, but definitely better than the day before. I’m keeping my fingers crossed that it doesn’t come back! I absolutely cannot afford to be sick during the week. Even though I was feeling okay, I kept it low-key yesterday to avoid it coming back. So here’s what I did! I actually slept in a little bit! It’s crazy that 9:00 a.m. is really sleeping in for me. When I was in high school I used to sleep in until noon any chance I got! I laid in bed for a little while, catching up on blogs and all that jazz. I really wanted to move, but I knew going to the gym wouldn’t be a good option for me. I decided to pull out this Biggest Loser Cardio max DVD I have had for quite a few years. I haven’t done it in a few months, and I forgot how intense it was! I was planning on just taking it easy through the workout to go easy on my body, but ended up dripping in sweat by the end. I was feeling awesome, so I figured, why not push it? Wanna see my cuuuuuuute workout attire when I exercise at home in my room? Let that sink in. Fitness model material right there. Ignore the Jillian Michaels bikini pic taped to my mirror. She inspires me. And check out that hair. High pony like whoa. Ignore my dinosaur looking arm. I was trying to show you how obnoxious my hair usually is. I took my sweet ol’ time getting ready and honestly didn’t end up leaving my room until about noon to get some lunch. I know, I know. I should never skip breakfast. But I did. Sue me. I did have a delicious lunch though. Salad with cherry tomatoes, carrots, and some homemade dressing with a little bit of olive oil, balsamic vinegar, and bread-dipping spices (cheesy garlic flavor). A peanut butter and jelly sandwich, made with PB2 and some raspberry preserves, plus some un-pictured hummus, carrots, and hummus chips that I snacked on while putting it all together. After lunch and getting ready for the day finally, I grabbed a berry Naked juice and headed out to run a couple of errands. I ended up donating all my clothes and books I pulled out over the week that I don’t use to the Salvation Army, getting my free monthly underwear from Victoria’s Secret, getting my free bra from Aerie AND spending my $10 off of $40 coupon, and stocking up on some brush cleaning spray from Sephora. I also got Gabby (the 4 year old I nanny) a couple of things for her upcoming birthday and stopping at Starbucks to spend some of my gift card momma got me for Valentine’s Day. Can you guess what I got? So unbelievably good. I get it a grande with soy milk, no whipped cream, and an extra shot of espresso. Then Luke and I settled in for the night with some Chipotle. Is it acceptable to have basically their chips and guacamole for dinner? I sure hope so. Because that’s basically what I did. I also had a couple bites of my veggie bowl I suppose, but it just doesn’t compare. I also had some of this classy stuff. I was asleep by 9:30 and feel great this morning. Score for 1-day sicknesses! I also thought I would leave you with this picture of the girls I nanny. The little one is Francesca and her older sister is Gabby. I talk about them all the time, so I figure you should see what they look like! They’re pretty darn cute. Oh hello! So here’s how computer savvy I am (not). I’ve heard great things about windows live writer all around the blog world, so I thought I would give it a shot, too. I googled it and started the download process to find that it’s been on my computer this whole time. Probably since I got it 5 years ago. Nice job paying attention to detail Allison. Anyway, I now have the program updated, connected to my blog, and running. I’m actually currently using it to type this post! So let’s see how this publishes. There will probably be some funky stuff, since I’m sure I didn’t set it up right; I’ll most likely have to play trial and error for a while. So far it’s seeming pretty cool though! I’m sure I’ll learn a lot from this program; you guys have already opened my eyes to so many things I didn’t know about the internet before blogging. Let’s rewind to last night when I had this dessert…. My 10 year old sister actually came up with the idea for this bowl! It’s Costco vanilla frozen yogurt with some sliced strawberries and dark chocolate chips. Delicious. Go buy Costco’s frozen yogurt immediately if you’ve never had it before. Moving on to this morning, I have actually been quite busy! I started off the day with literally rolling myself out of bed (I swear, my head was stuck to the pillow) and going to jazzercise for an hour. The class was actually great with a ton of high energy; I’m glad I went! Not that I really had a choice…I’m a class manager so I need to go to classes a half hour early to check in customers and help the instructor with anything they may need. After that I came home and had some breakfast and did a couple of Tone It Up workout videos. While I was working out, I had the TV on as well (I was playing the DVD in my laptop) and kept seeing a news story about a 30 car accident on a local highway that resulted in 4 deaths: 3 children and 1 adult . Heartbreaking. Definitely sending happy thoughts out to all those affected <3 This is a picture someone involved in the accident took of the cause of the accident. The news anchor said that there was a 5 second white-out from all the snow, causing limited visibility and this huge mess. You can see my living room reflection in the picture, but it really lets you tell how white the road was. Super dangerous. After finishing up my workout, I had some lovely leftovers for lunch. I still had like 1/3 of my vegetarian bowl from Chipotle last night. I toasted up a multi-grain sandwich thin, spread it with some roasted red pepper hummus, added some fresh lettuce, and then poured on my Chipotle. So. Freaking. Good. I had the rest on the side, along with some more hummus and baby carrots. This is the best sandwich I’ve ever had, seriously. Since lunch I have been doing some serious work on new workouts for clients (and for you guys!) and focusing on finishing up my various client introductory packets. It’s a lot more work, and much more time consuming, than it seems! I just made myself this snack of an apple and 1 tbsp. cookie butter and some TJ’s green tea, which I’m going to have while I work on some more training stuff and continue to work on developing my website. Thank you so much to all of you who offered help with design; I’m going to take you guys up on that! I gave Luke some of the cookie butter the other day, and his face was hilarious. I think he wants to put it on everything now. Poor guy is allergic to nuts, so he’s never even had peanut butter, almond butter, etc. This is the next best thing! In my opinion, it’s even better. What’s the best sandwich you’ve ever had? 1. Olive Garden leftover cold mashed potatoes are quite possibly my new favorite thing, ever. 2. Chipotle. Is. Wonderful. Why have I never had this before!? Luke bought it for us after training at the gym, and I am obsessed. I got a vegetarian bowl with brown rice, grilled veggies, some chunky tomato stuff that was surprisingly spicy, some corn mixture thing, and lettuce. We got chips and guacamole to split, which were equally fantastic. Alright, now to talk about some new stuff. I’ve talked on here a little bit about how I recently got a job personal training at a local gym. I decided to take a leap and put www.arealisticlife.com on the 250 business cards I ordered. You know what that means? I gotta buy my domain! Luke is going to help me set up the website hopefully within the next couple of days, so the link is going to switch a bit; just a FYI. Obviously I won’t stick to this perfectly, but I need some sort of outline to keep me sane. The other daily post will probably be about my day, my food, my workout, my annoyances (:p), etc. Basically the normal stuff you’re seeing on here now. Just wanted to give ya’ll a heads up on what’s goin on over here! Thoughts? Suggestions? What’s your twitter link? Do you have any recommendations of someone to help me with designing a website?